It's a declaration of war against Mexico's biggest drug kingpin, the Morales Cartel. But those out for blood aren't the DEA or Mexican authorities. In a coup fueled by greed, power and betrayal, an unholy Mexican-American alliance is fighting for command of the pipeline on both sides of the border. Using mercenaries as hired guns, the alliance spreads a violence-fueled message: step aside or die. Mack Bolan heads an elite handpicked task force of dedicated soldiers with the skill and grit it takes to infiltrate both ends of the drug-smuggling operation. Guns blazing, Bolan's team rides the road from the Brooklyn-based Winnebago dealership using RVs to smuggle the drugs into the U.S., to the brutal heart of cartel country. But they're up against a trained fighting force paid well to bring back their heads. Never ending action and some suspense, some misspelled words, unusual for you. But good reading. 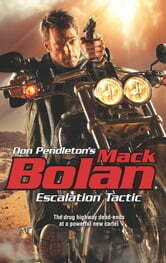 Mack teaming up with others makes the story less tactical, taking away from his one man show.